For those unfamilar with the term “bostin” it is a Midlands term (Mrs. SF is from up that way) meaning something really good, amazing etc. 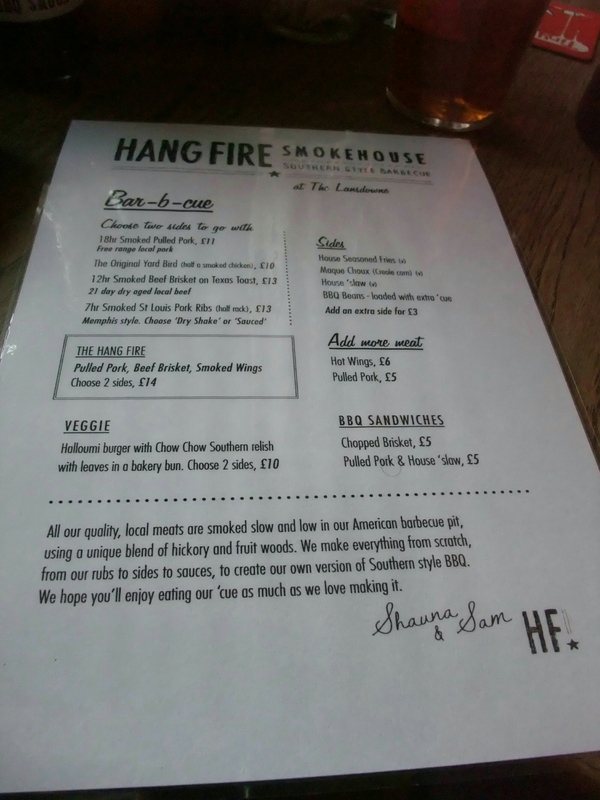 I think it is a rather good word and it describes very well the experience and fare put on by the wonderful Hangfire Smokehouse (run by two self confessed American BBQ nuts called Shauna and Sam) on my visit to where they currently operate, The Lansdowne , a pub in Canton, Cardiff. Bearing in mind my ongoing obsession with all things BBQ and smoking (food not cigarettes! ), it has taken me a while to make my way to Hangfire. 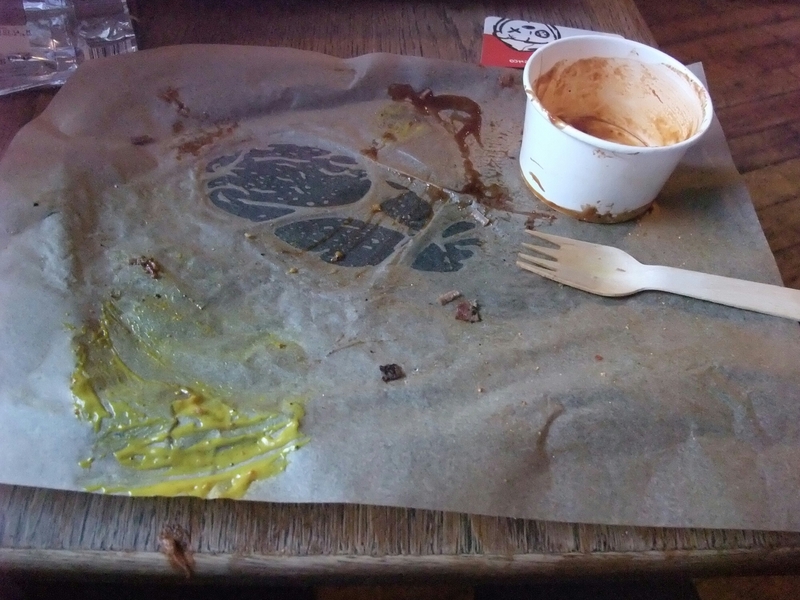 This was despite the almost evangelical eulogising about the place from Cardiff blogger, The Plate Licked Clean (always a good read and someone who knowns and loves their food a lot). There are a number of reasons for this. It operates on a no booking basis, only opening on Thursdays and Fridays between 5pm and 9pm and dishes (due to the low and slow cooking nature of Hangfire’s food) are limited in number and sell out as the night goes on. With my work, getting there before 8pm is tricky :(. A more selfish reason is Mrs.SF has been rather impressed with my BBQ/smoking efforts to date and I feared (entirely justifiably as it transpired) that this place would put my efforts to shame. Last Friday, I was thankfully able to get out of work early and hot footed it back home having phoned ahead with instruction to Mrs. SF to get ready as we’re going out for BBQ. 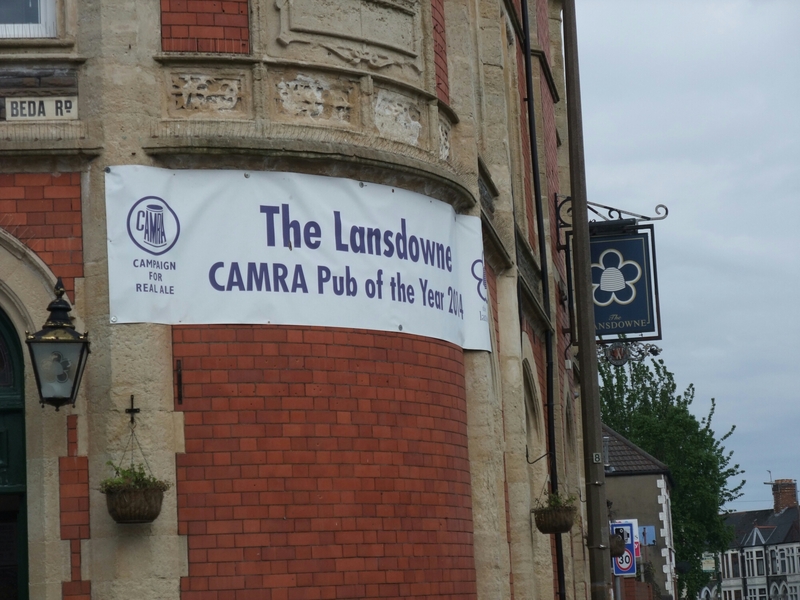 On arriving at the Lansdowne pub, at just after 6pm, it was packed to the rafter. After I tried to swipe a table (not knowing the system), I was quickly put right by a lady with a clip board and cowboy hat and put on a list for a table. 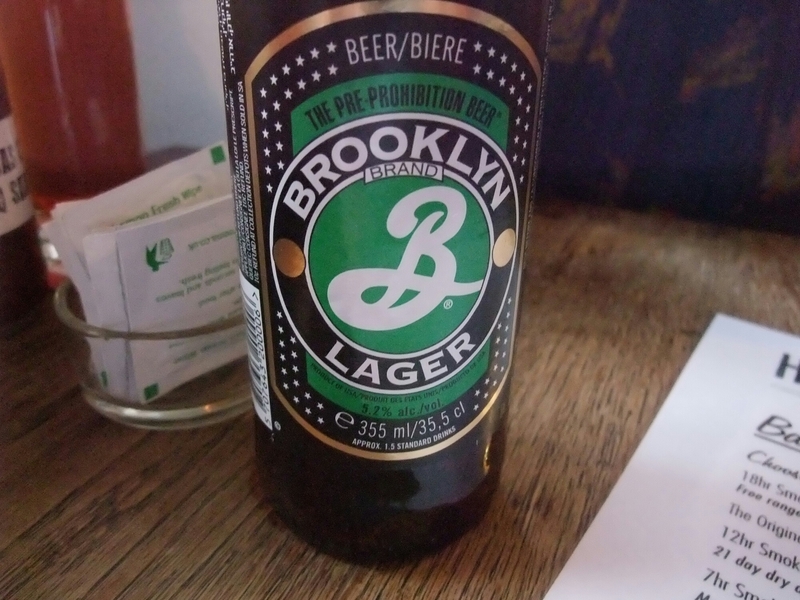 This gave me the chance to peruse both the short menu (decisions, decisions – it all sounded so good) and to set to work on sampling the rather fine draft and bottled beers on offer at the Lansdowne (I went for a Sundown Ale from Untapped Brewing Co., Mrs SF a Brooklyn lager). In double quick time a table became available and before we were seated we were shown the ropes by the lady in the cowboy hat in terms of ordering. It took a while to decide what to eat from the menu (with the deal being each main comes with a choice of two sides) as I wanted everything. Small but perfectly formed menu. This dilemma was exacerbated by a blackboard special of Texas hot links and burnt ends . 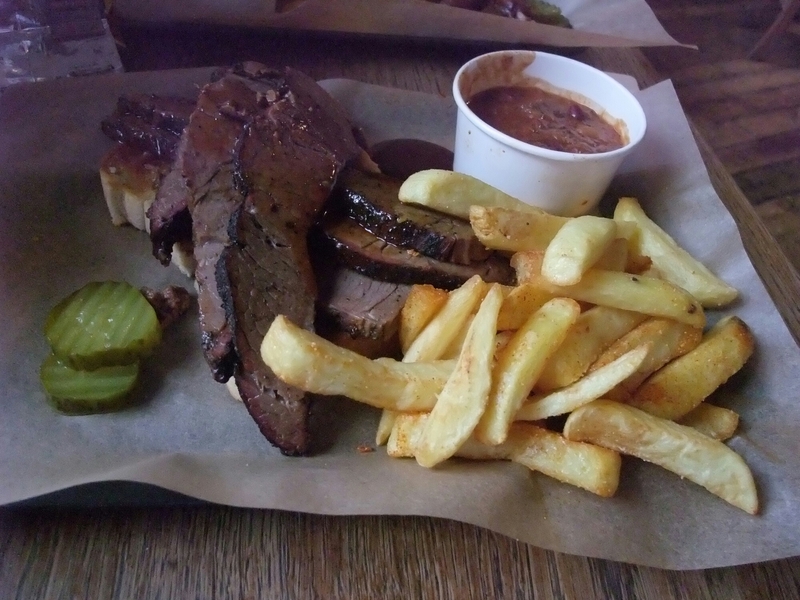 After changing my mind at least four times (including twice whilst queueing to place our order and pay), I went for 12 hour cooked 21 day aged brisket on Texas toast, with sides of fries and BBQ beans. Mrs SF rather inexplicitly went for chicken, with sides of fries and coleslaw, citing red meat overload on the Bank Holiday weekend as the reason. I had wanted her to go for the ribs so I could nick some. The lady taking the orders (Shauna I think, but am rubbish with names and often cause Mrs SF irritatation by failing to introduce her to people – which is because I cannot for the life of me recall their names. I dread, on such occasions Mrs. SF saying “Aren’t you going to introduce me”. Must be my age!) 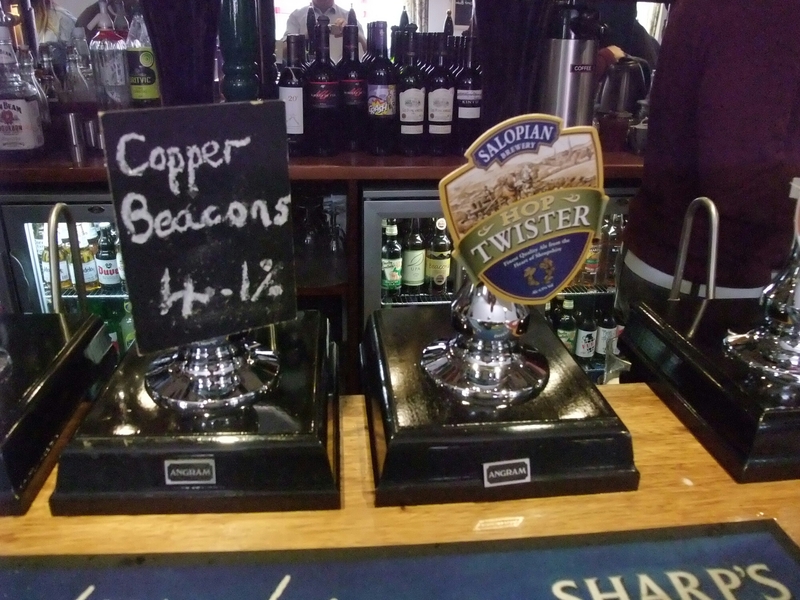 was wonderfully friendly and told me as they were quite busy there would be a bit of a wait (she was actually specific re the minutes) and said best in the interim to enjoy the beers on offer ( her words were somewhat more irreverent). In term of the table and food here, it is down and dirty dining so don’t expect napkins, plates or metal cutlery. Our food arrived almost to the second I was told on ordering that it would (how did they do that) and it looked and smelt bloomin lovely. My brisket was quite simple phenomenal. I chose it as it as cooking it is a lengthy and tricky process which if you get it wrong means you get a tough, dried out piece of meat. This was a quality piece of meat cooked to perfection. The result was beautifully moist, so tasty and meltingly tender. There is a risk in smoking food of over doing the smoke and masking the flavours of what you smoke. 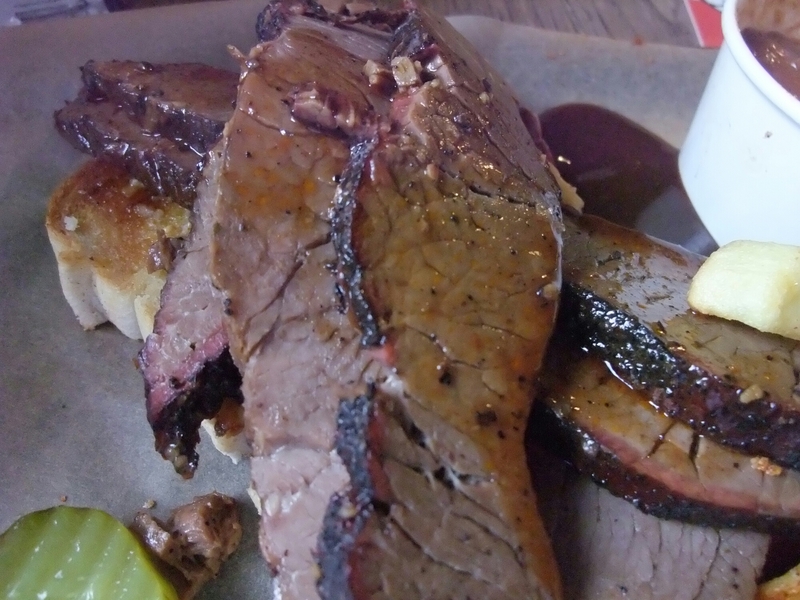 Here the level of smokiness was bang on the money, just right to extenuate the flavour of the meat by added another level on top of that of the brisket. The Texas toast (toasted white bread covered in garlic butter) soaked up the juices and as a result added a nice beefy garlicky hit to the proceedings. Together it was just lip smackingly yummy. Mrs. SF, who is not a massive fan of beef (I know !!?!! ), loved the piece I, somewhat begrudgingly, gave her to try. As for the sides, my fries were crisp on the outside and fluffy on the inside (as a good chip should be) with a lovely seasoning on them. The BBQ beans were sensational. 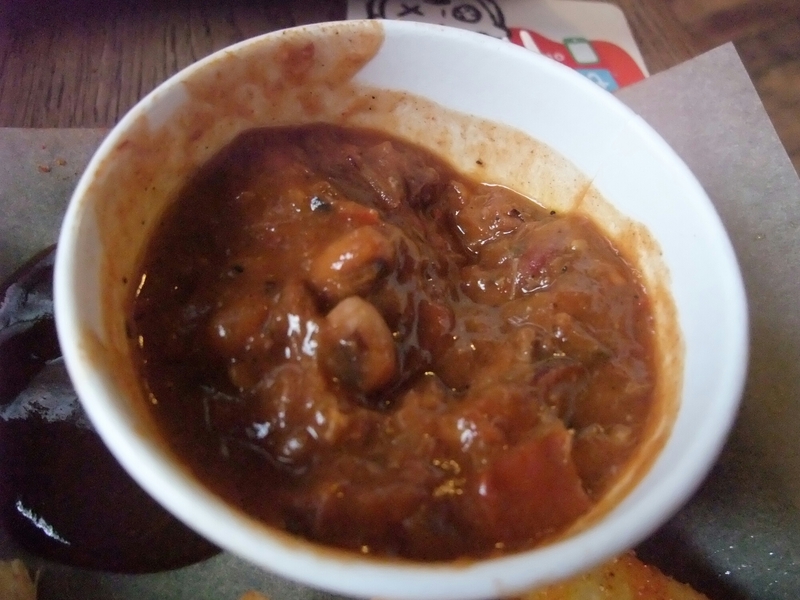 More a Texas chilli with beans, it had a lovely smokiness to it and layer upon layer of spice (rather than heat) and oodles and oodles of flavour. God it was good. I thought my Texas chilli was quite good, but this well and truly stomped mine into the dirt and kicked its ar*e for good measure. Mrs. SF positively swooned on tasting it, confirming its vast superiority to mine. I could have eaten a bucket of it. 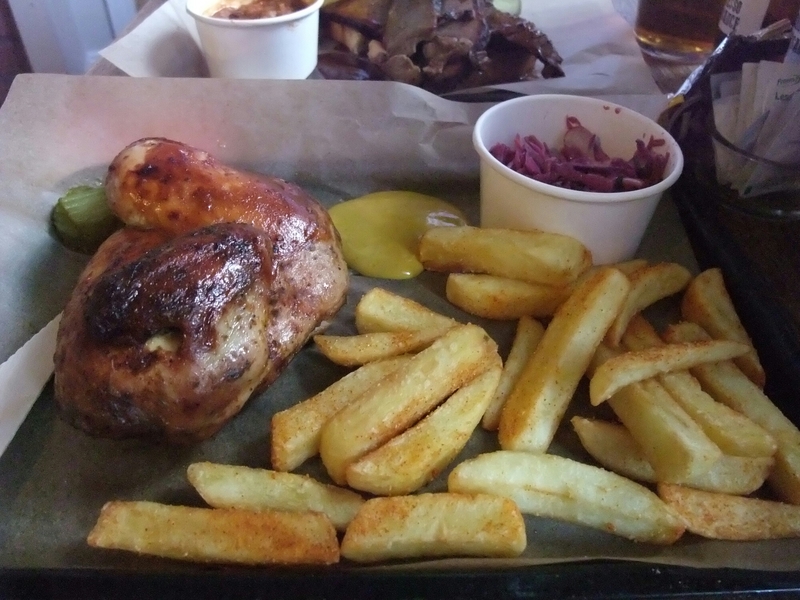 Mrs. SF, with her barbecue chicken , went for sides of fries and a very nice red cabbage based coleslaw (which had just the right level of acidity to it). Whilst she enjoyed the chicken and picked it clean off the bones, I think on seeing my brisket and the fare being delivered to other table (ribs looked particularly good) she regretted it a bit. I had a taste of her chicken and the meat had a good flavour to it and was nice and moist. I should also mention the killer BBQ sauces on the table. 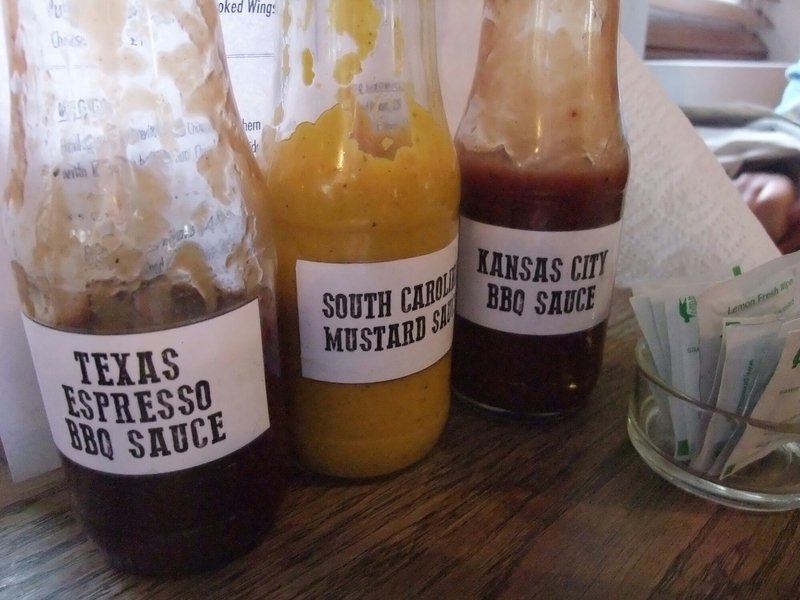 I had the Texas espresso BBQ sauce with my brisket and Mrs. SF the South Carolina mustard sauce with her chicken. Both were really good and I would pay good money to buy this stuff retail. The South Carolina mustard sauce in particular took our fancy (the chips/fries were great dunked in it) and I think I could have happily drunk it neat. We finished off proceedings by sharing an exemplary brownie (crisp on the outside and gooey in the middle) and vanilla ice cream. Wow, the food was amazing. I could not find fault with anything we ate. The welcome and service was great and Shauna’s and Sam’s enthusiasm for BBQ is infectious and boy do they have great food to be enthusiastic about. Being ultra picky it would be nice if could book, I suppose, but it really wasn’t an issue. – Dessert £5 (or could of been £4.50). With a few drinks we had a stonkingly good meal for less than £40. That to me is excellent value. Testimony to how much I enjoyed the food. Will I go back? Hell yes, Mrs SF and I were talking about what we would have next time before we had left the table! 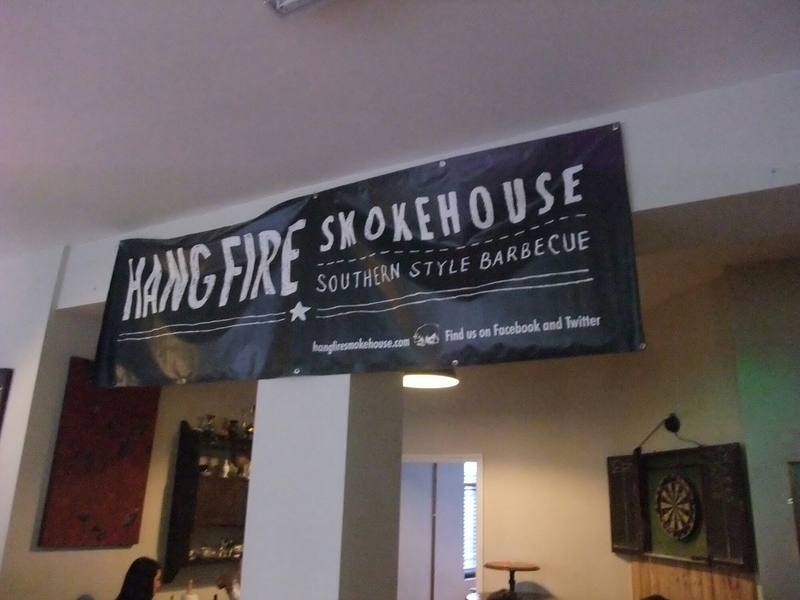 My only slight regret about Hangfire Smokehouse is they make my BBQ efforts seem rather feeble, but half the fun of BBQ is learning and they have made me realise I have a load of learning to do. This is food that makes people happy and on the night it question, due to Hangfire, the place was full of happy people including Mrs. SF and I. What more could anyone want from a plate (well tray as don’t get a plate) of food. To (the) regular reader(s) of this blog (thanks Mum), going forward I will generally be posting once a week on Sundays. I may, on occasion, post more frequently but expect most to be on a weekly basis. Reblogged this on Unique Places Cardiff. 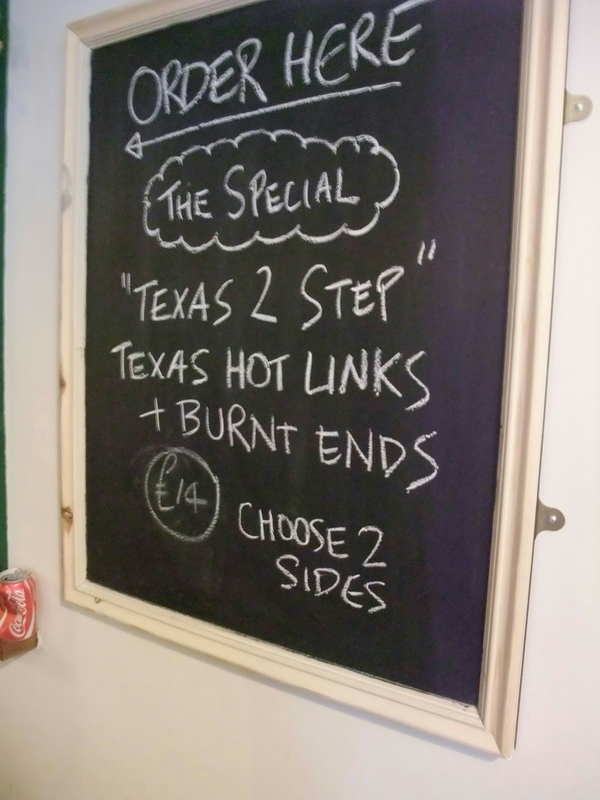 This entry was posted on Apr 27, 2014 by solicitingflavours in Barbecue, Cardiff, Hot smoking, Restaurant Review, Wales.